When one enters a residential property, the journey begins from the approach through the transition to the front door and beyond. Our design professionals work with what the land has to offer and looks at both human traffic patterns as well as vehicular patters. It is particularly pleasing to have guest arrive in a designated parking space or courtyard where to park their cars and walk the rest of the way. To bound these courtyards with walls or vegetation makes the invitees experience a sensation of arriving, albeit to the front door yet. We try and segregate the parking space far enough from the front of the house to allow the guests to appreciate the architectural character of the home. If too close, this cannot be achieved. The idea of a graceful entrance weighs heavily on the design choices we employ. 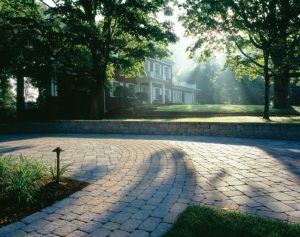 We are IVY Studio, a landscape design and build firm based in the metro Boston area. Contact us at 781-591-0300 or vern@ivystsudio.MA.com to let us plan your visitor parking space as part of your next outdoor expansion project.